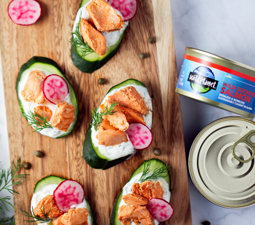 Salmon Cucumber Bites - A recipe from Savor California, the online showcase for extraordinary gourmet foods and beverages from California. In a small bowl, mix together the Greek yogurt, chopped capers, and chopped dill. Place a small dollop of the Greek yogurt mixture onto each cucumber slice. Empty the Wild Planet Wild Sockeye Salmon into a bowl and lightly flake with a fork. Place salmon pieces onto each prepared cucumber slice and top with a sprig of dill, a radish slice, a squeeze of lemon and some freshly ground black pepper.